If the Universe is expanding, are we also expanding? We have already known the fact that the fabric of the space-time is expanding throughout the visible Universe according to the observation of the clusters of galaxies. The expansion of the space-time fabric gives observers a way to predict what happens at the next phase to the distance between celestial bodies. 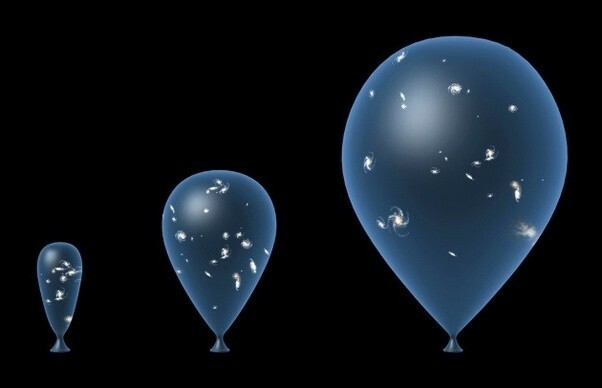 But, if the Universe is expanding, is the scale of our world changing? To better comprehend this expansion, we need to understand the fabric of the space-time. It can be hard to envisage the fabric of the space-time as an intricate plain system defined by the fundamental forces, especially the gravitational force. But, as a rudimentary form of the fabric of the space-time, you can imagine the elastic surface of a balloon. The inflation of the elastic surface of the balloon affects only its attached parts such as dots printed on the elastic surface. In other words, the inflation changes scale when the affected object is a part of the elastic surface of the balloon. In that regard, if the affected objects are not a part of the membrane, the inflation of the elastic surface of the balloon increases the distance between the objects. As a thought experiment, we can apply the same situation to the fabric of the space-time. At these scales, gravitation dominates and prevents the dilation of space(1). Which is why the clusters of the galaxies can be defined as sequins or dimes glued to the membrane. And, also, at smaller scales, atomic and molecular forces in familiar objects are even stronger, and objects sizes do not change(1). So, the expansion changes nothing but the distance between the observed objects indicating the effects of the various cohesive forces that work at small scales. Neither the scale of our world is changing, nor we are expanding because of the expansion of the fabric of the space-time. The fundamental forces, especially the gravitational force, prevent a scale shift due to the expansion and make our size a constant value. (1) Bely, Pierre-Yves, Christian, Carol, and Roy, Jean-René. "If the Universe is expanding, are we also expanding?." A Question and Answer Guide to Astronomy. Cambridge: Cambridge University Press, 2010. 137. Print.